Alligator Shoes, Arthur Dorros. NY: Dutton. 1982. Use a map and identify where alligators live in the United States. Create mobiles to hang in your room or the media center. Have students work in groups of four and have them each design two kinds of footwear for the mobile. Use yarn or string and old wire hangers. Create a display with shoes. Students could bring in treasured shoes, such as baby shoes, cowboy boots, wedding shoes, etc. Write creative stories about the life of a shoe told from the shoe’s perspective. Discuss other shoe styles that Arthur Dorros might have included in his story. Draw pictures of the alligator in the shoes. Imagine that you were locked in a store like Alvin. What kind of store would it be? What would you do? Write a story based on this possible experience. Read stories about alligators and about shoes. Read a Lyle book by Bernard Waber. Do you think that they would be friends? Think of things they might do together and draw a picture of them. 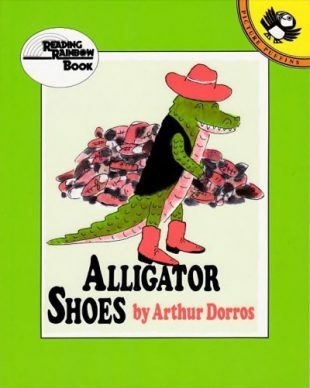 Alligator Shoes is a “Reading Rainbow” book. Using a television guide, locate the time and channel on which this program is aired. Jerome the Babysitter, Eileen Christelow. NY: Clarion Books, 1985. An Extraordinary Egg, Leo Lionni. NY: Knopf, 1986. A Hat So Simple, Jerry Smath. Mahwah, NJ: Bridgewater Books, 1993. Monty, James Stevenson. NY: Greenwillow Books, 1992. Peter and the Talking Shoes, Kate Banks. NY: Knopf, 1994. Shoeshine Shirley, Leah Komaiko. NY: Doubleday, 1993. Shoes, Elizabeth Winthrop. NY: Harper & Row, 1986. Special thanks to Ric Blank, Sandy Hill Elementary, Jenison, Michigan, and Marja Eloheimo for activities and lesson plans.